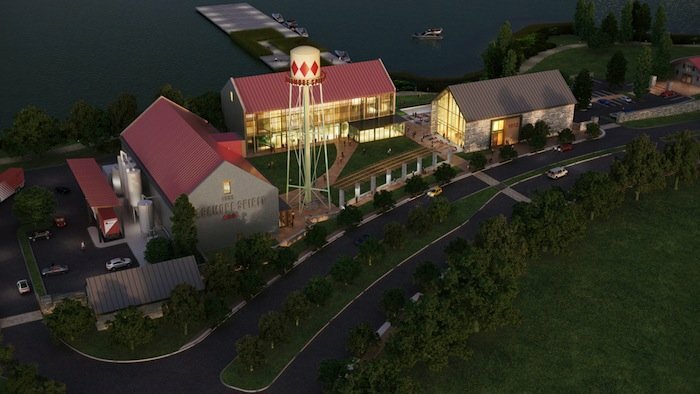 Sagamore Development is hoping to combine the feel of its Sagamore Farm thoroughbred horse farm in Baltimore County, the industrial history of Port Covington, and the Chesapeake Bay in its plans for the five-acre Sagamore Spirit distillery at 301 E. Cromwell St. in Port Covington. The plans for the distillery were first revealed yesterday at Urban Design & Architecture Review Panel (UDARP). 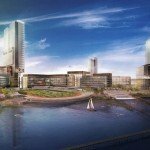 Sagamore Spirit and Sagamore Development are owned by Under Amour CEO Kevin Plank, who recently announced an ambitious mixed-use redevelopment plan for the more than 90 acres of Port Covington real estate Sagamore Development has acquired, which will include up to three million sq. ft. of office space for Under Armour. Plank is also the owner of Sagamore Farm, which first opened in Glyndon in 1925 and features a natural spring that is filtered by limestone and used by the farm’s horses for water. Plank discovered this water would also be perfect for distilling rye whiskey. 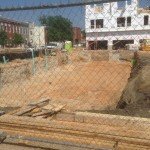 Shawn Batterton of Sagamore Development told SouthBMore.com that Maryland was formerly known for rye whiskey and Baltimore was previously the home to more than 20 distilleries. When researching the history of 301 E. Cromwell St., Sagamore and the design team from Ayers Saint Gross ironically discovered that the site was once the home to a distillery before becoming the home to a depot for the Western Maryland railroad. The site was originally home to Fort Covington, which was used to defend Baltimore during the War of 1812. Architect Scott Vieth of Ayers Saint Gross said they were looking for simple geometry in the design which brings many elements from Sagamore Farm. Three of the buildings will have red roofs and grey brick, modeled after the stables at Sagamore Farm, and the restaurant will have a grey roof and a stone facade, modeled after the spring building at Sagamore. The buildings will also have facades comprised of windows that will glow at night, showing off features such as the whiskey stills and wood whiskey barrels toward the existing road and waterfront. The windows will also provide waterfront views for the restaurant. Sagamore Spirit will offer daily tours and a tasting. They are currently speaking with operators about the restaurant space, which will feature a 6,000 sq. ft. first floor with a dining area, kitchen, bar and gallery and a 4,000 sq. ft. second floor event space. Panelists at UDARP were critical of some design elements of the plan, saying that the water tower could be constructed with more industrial character or replaced by something that further symbolizes the area’s industrial past. 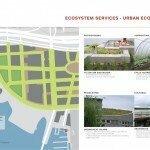 They were also critical of the landscaping architecture in the plan, saying it may need to be simplified. 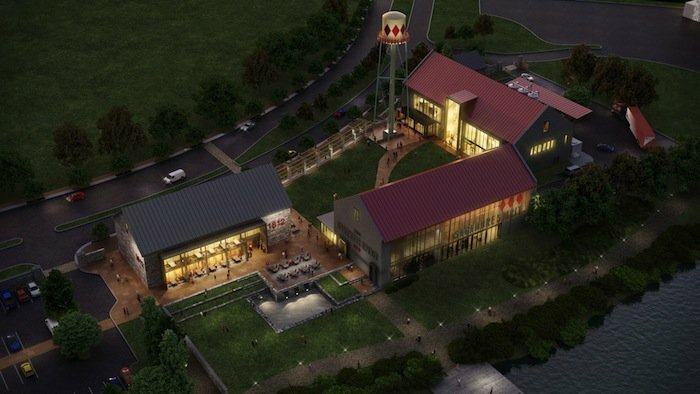 Sagamore is hoping to begin construction on the distillery later this year and anticipates an approximately 14-month timeline. 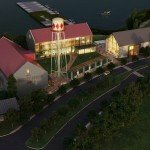 Batterton told SouthBMore.com that the distillery will give Sagamore Spirit space for future growth and that they anticipate future employment opportunities coming to the site. He also stated that barrels of whiskey are already in production and that they hope to launch the rye whiskey at next year’s Preakness. Batterton said they are also committed to doing their part to keep the shoreline clean of trash and debris. The team was mum on Sagamore’s other future plans for Port Covington as an area master plan still needs to be created.